MK Eitan Cabel accuses Rabbi Shmuel Eliyahu of racism, seeks to bar him from the race for Chief Rabbi. 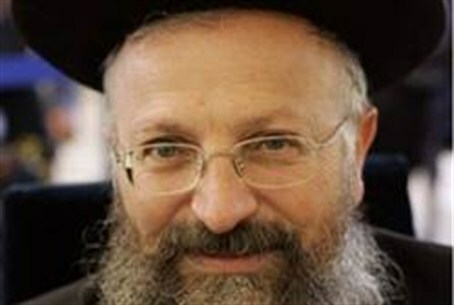 Rabbi Shmuel Eliyahu, the chief rabbi of Tzfat (Safed) continues to face opposition from the Israeli left as he considers running for the post of Chief Sephardi Rabbi of Israel. MK Eitan Cabel of the Labor party sent a letter Saturday to the Attorney General asking him to bar Rabbi Eliyahu from the race. “Of the candidates, the most disturbing is Rabbi Shmuel Eliyahu, who in recent years preached racism, and put it into practice with a halakhic [Jewish legal – ed.] ruling prohibiting selling or renting apartments to Arab citizens,” Cabel wrote. There have been reports that Rabbi Eliyahu is planning an apology for some of his statements. Cabel said that would be insufficient. “No apology will fix the damage caused by his remarks. The rift he created between Judaism and the Arab public cannot be mended with lip service,” he argued. MK Esawi Frij of Meretz has also spoken out against the possibility that Rabbi Eliyahu could join the Rabbinate race. “This is a primitive racist, who incites and who hates Arabs,” Frij charged. Rabbi Eliyahu’s controversial statements were made following complaints that Arabs were moving into Jewish neighborhoods and disturbing Jews in Tzfat, one of the four traditional holy cities cited in the Talmud.